This article is about Salon Aprons. For other uses, see Apron (disambiguation). Look up apron in Wiktionary, the free dictionary. 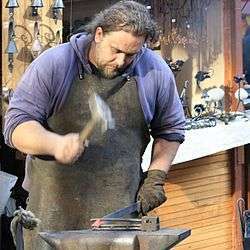 A blacksmith wearing an apron. An apron is an outer protective garment that covers primarily the front of the body. It may be worn for hygienic reasons as well as in order to protect clothes from wear and tear, or else due to a symbolic meaning. The apron is commonly part of the uniform of several work categories, including waitresses, nurses, and domestic workers. Many homemakers also wear them. It is also worn as a decorative garment by women. Aprons are also worn in many commercial establishments to protect workers clothes from damage, mainly bib aprons, but also others such as blacksmith or farrier aprons. In addition to cloth, aprons can be made from a variety of materials. Rubber aprons are commonly used by persons working with dangerous chemicals, and lead aprons are commonly worn by persons such as X-ray technicians who work near radiation. Aprons, such as those used by carpenters, may have many pockets to hold tools. Waterproof household aprons, made of oilcloth or PVC are suitable for cooking and washing dishes. The word apron is from the metanalysis of the term "a napron" to "an apron". The original spelling of napron has been lost (from the Old French naperon; Modern French napperon). There are many different apron forms depending on the purpose of the apron. A basic distinction is between waist aprons which cover the body from the waist down and a bib apron which also covers the upper part of the body. Some modern day aprons will have humorous expressions, designs or corporate logos. A tabard (British English; cobbler apron in U.S. English) is a type of apron that covers both the front and back of the body. It is fastened with side ties or with waist bands that tie in the back. 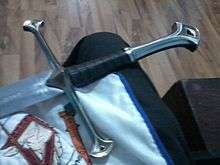 It covers most of the upper part of the body and is used in many vocational occupations. The original cobbler's apron was typically made of leather. A bungalow apron is an item of women's at-home clothing. Most bungalow aprons were extremely simple garments, often with kimono sleeves (sleeves cut in one piece with the body of the dress), little or no trim, and the fewest possible fasteners. Most date from the first half of the 20th century (roughly 1910 into the 1940s), when they evolved into or were replaced by the "patio dress" or "lounger" available today. Woman of the 1920s wearing a full-length house apron with criss-cross straps. The term apron also refers to an item of clerical clothing, now largely obsolete, worn by Anglican bishops and archdeacons. The clerical apron resembles a short cassock reaching just above the knee, and is coloured black for archdeacons and purple for bishops. The apron is worn with black breeches, reaching to just below the knee, and knee-length gaiters. The history behind the vesture is that it symbolically represents the mobility of bishops and archdeacons, who at one time would ride horses to visit various parts of a diocese or archdeaconry. In this sense, the apparel was much more practical than a clerical cassock would be. In latter years, this vesture was more symbolic than practical, and since the mid-twentieth century it has fallen out of favour. In freemasonry, each of the degrees to which its members belong has a specific way to wear the apron. ↑ apron, n. Oxford English Dictionary, Second Edition 1989. ↑ Burton, Ida Robinson; Burton, Myron G. (1916). "Bungalow Apron". School Sewing Based On Home Problems. Ginn And Company. Retrieved 2013-01-22. Wikimedia Commons has media related to Apron.